T-Advisor does not stop improving the platform and providing professional advanced tools for individual investors in an accessible and easy way. This is the new case: our bootstrapping tool. What is bootstrapping? It is a statistic complex calculation, which is possible to make due to the current computing capacity. This calculation provides an estimation of different results with the probability that it happens, taking into account the past evolution. We apply it to calculate projected returns, also known as forward testing. Think about your portfolio. As investors, we are sometimes doubtful and impatient. We would like to know how my portfolio would evolve. We are not a kind of psychics or fortune tellers. On the contrary, we are very scientific. Our bootstrapping tool does not provide the certain results, but the possibilities that your portfolio performs in different ranges. The performance simulation for the time frame you have chosen. It displays the maximal possible loss, the time to breakeven and the evolution of the possible good, expected and poor results. 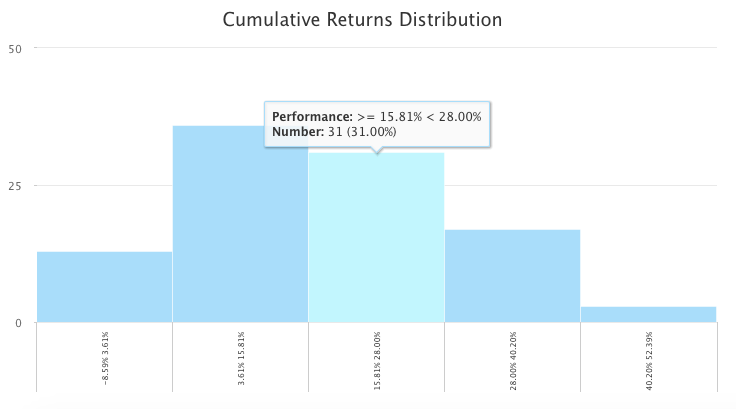 The cumulative returns distribution that explains the possibilities (in %) to obtain a specific range of returns. And the cumulative returns in a selected year with the probability that it happens. The bootstrapping tool is very useful to detect possible negative evolutions of your investments. 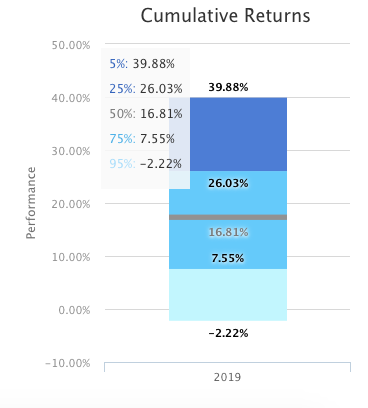 The screens helps you make changes and rebalancings in your portfolios to improve your results. As we insist, it is a statistic analysis and provides projections that will change depending the modifications that you include in your portfolio. T-Advisor has also implemented the bootstrapping tool to make forward testing in shares, funds and ETFs. We will write soon about it. This entry was posted in Discover and tagged bootstrapping, cumulative returns, forward testing, Performance, Rebalancing, simulation on September 28, 2016 by Oscar Garcia.